There are ethical problems wrapped up in writing historical fiction. Should you use a real, once-living person as a character in your fiction? Their lives reduced to nothing more than plot points and themes? In essence, a human being’s existence shackled to the pursuit of the writer’s own ego? Would you want some future author to make you the bad guy in their little story, the walk-on joke, the mumbling idiot, the obstacle? And let’s face it, we don’t even know what the people around us are truly like, never mind those who existed hundreds of years ago. In those cases, we often only have a few scraps of paper to sketch out the things they did, with little hint to their motivation. This becomes even more of an issue in fantasy, where the historical characters are divorced from the realities of their lives. It’s something I’ve certainly struggled with while writing the Swords of Albion books, which utilise a host of real people from the Elizabethan age. To be honest, even after writing I find it hard to decide if it was the right thing to do. I justified it to myself by my attempts to make the historical figures as true to how contemporary accounts described them, but that still leaves a great deal of psychological gap-filling. The Sword of Albion and The Scar-Crow Men are set around the Court and Government of Queen Elizabeth, but she plays only a secondary role. I have less interest in the cosseted lives of Kings and Queens than I do in the men and women who do their bidding. The stories concern spies, who had, for the first time, become a powerful weapon of the state in this era. And so in the first book one of the central characters is the spymaster Sir Francis Walsingham, a dour, puritanical man who suffered much personal misery in his life, but who gave his all in service to the Queen. His successor in The Scar-Crow Men is Sir Robert Cecil, a clever, cunning politician who battled against prejudice and mockery for his hunchback and short stature – the Queen called him her ‘Little Elf’. These two men represent different approaches to power and control, one quite honorable, the other self-serving. They act as counterpoints to the flawed, vacillating central character, the spy Will Swyfte. Swyfte’s friend is the acclaimed playwright Christopher Marlowe, a contemporary of Shakespeare who wrote Dr Faustus and Tamburlaine among other plays. He was something of a rising celebrity at the time. He may have been a spy (there is some evidence); he may have been gay. In the books, Marlowe is another counterpoint to Swyfte, a man slowly being destroyed by the dark business of spying and the demands placed upon him by service to the state. Marlowe allows the reader to see Swyfte’s strengths and flaws more easily. Despite my antipathy towards the lives of Royalty, the fact that important people play important roles is inescapable in this era. The common man was mainly concerned with simple economic survival. And so, as Swyfte travels the known world in his spying, we encounter James VI of Scotland (and future James I of England), Philip II of Spain and Henri of Navarre, the future Henri IV of France. Each one responds – and responded – in different ways to their regal status, and again, each one allows us to see Swyfte in a different light. Dr John Dee is a key figure in both books, and the third, to come, and he really is the link between the history and the fantasy. Dee, who tutored the young Elizabeth, was both a scientist and an occultist, an inventor and mathematician who communed with angels and cast magic circles. Many of the themes I’m tackling have Dee at their centre. There are others – Sir Francis Drake, Walter Raleigh, the Earls of Leicester and Essex, the master criminal Laurence Pickering, the King of Cutpurses, who may or may not have been an invention of the Elizabethan equivalent of the tabloids. Each one was chosen carefully for what they said about Will Swyfte, in the same way that any writer chooses supporting fictional characters. I hope I did them justice, but know in my heart I didn’t. No writer could. I don’t know that they will mind… I know that I wouldn’t mind if it was after I died… even beforehand I think I would be really pleased to have my name in print even if the character was nothing like me…I think most right thinking people would know that there might be some poetic licence used, and really, when you take the story as a whole does it really matter as long as it adds flavour? Can’t wait to read it. Roll on May. I like to think that I do my historical personages more justice than certain Hollywood writers, who claim to present a “true story” but then alter known facts simply to make it more dramatic (yes, Michael Hirst, I’m looking at you! ), or worse still, invent incidents to blacken names where shades of grey are not enough. That might have been acceptable in Shakespeare’s day, when monarchs still had the power to lop off the head of anyone who dared breath a word against them, but nowadays it’s just rank commercialism. At least we’re upfront about our fantasy being alternate history, an Elizabethan London that never was. What’s their excuse? 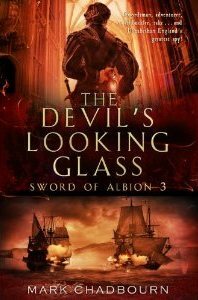 I think you have done a marvellous job with the characters I am currently enjoying in The Sword of Albion. You have obviously studied these characters in depth but as you have said you can never be 100% sure of their actual character in life. These people are were already immortalised before you wrote these books, so I’m sure if they magically turned up tomorrow there would be a few people they’d want to speak to before they came knocking at your door! I think the fact that you bring the subject up in your blog means that you approach it with conscoence and integrity. The world of folklore and literature has always played with the idea of fact and fiction blurring, take Richard the III for instance. Shakespeare had no such qualms about casting him as a villian despite there being much evidence to the contrary. It’s no different to putting fictional characters in a real setting(saving private Ryan) and far less perverse than ballsing up history to make a good romp (Braveheart). The books work on a “what if” premise with a healthy dose of fantasy. And fantasy is, and tis is only my opinion, far more enjoyable if it has a toe in reality, be that the laws or physics, human emotion or in this case historical background. I was far more put out that Mayhew was from a small village outside of hasting, like myself. We’re not all like that. Really enjoying the rich mixture of fact and fiction, so much so that it’s entered my teaching this term. We have been looking at Marlowe and the book has been ideal in exploring the idea of the supernatural being very real to people of the time and influencing literature. looking forward to the next two books. Laurence, completely humbled that you’re using the book in your teaching. Yes, I do take my responsibilities to writing seriously, particularly when I’m stealing the lives of real people. The fantasy element gives me a little more leeway, admittedly (and I agree that fantasy works better when it’s anchored by reality…) but I try not to be too fast and loose with the hard facts. And I send my apologies to the good folk living outside Hastings!